All Indie Magazine: Announcing the New Awards Ceremony Location, plus Get Featured in the AIMA Event Program! Announcing the New Awards Ceremony Location, plus Get Featured in the AIMA Event Program! In case you haven’t heard, the Artists In Music Awards has a new home! On Friday, February 7, 2014, the 2014 Artists In Music Awards will be held at the Jon Lovitz Theatre (formerly B.B. Kings) located in Universal City, CA. The venue is simply amazing. It has available standing room and lots of seating throughout the massive 3-level theatre. We are very excited to take our 3rd annual prestigious awards ceremony to this legendary venue. The stage is bigger, the sound is better, and the total experience is…well, just better. We are proud to announce that we have filled the line up for the main event featuring live performances by 2013 Album of the Year and Best Rock Artist winner - Glitter Rose, Best Indie Rock Artist winner - Walla, Best Folk/Acoustic Artist winner - Soren Bryce, Best Dance Artist winner - Melanie Taylor, 6-time AIMA Nominee - Cheating Daylight, and introducing Torrey Mercer and Max and the Moon. Prices range from $15 for general admission to $55 for VIP seats (meal included). Purchase your VIP dinner seats before January 15th and save $10! Additional: Due to the venue’s policy, there will be no guest list (No free attendance). Everyone must have a performer stamp, wristband, or media badge to enter the facility. If you purchase your tickets in advance, make sure to bring your receipt with you for proof of purchase, otherwise you will not be allowed entrance. At the box office, your ticket receipt will be exchanged for a wristband. Unlike years prior, we will be hosting the Red Carpet Event INSIDE on the 3rd floor. We anticipate over 50 members of the media in attendance, so make sure you put on your best digs. If you are a member of the media and you’d like to cover the Red Carpet and photo shoot the award ceremony, please send an email toinfo@aimusicawards.com to request coverage. This year, we are printing a special Event Program for the Awards Ceremony. Each program will list all of the Sponsors, Award Ceremony performers, and Final Nominees. 8 full-page feature pages will be made available for artists and/or business advertisements. If you’d like to be featured in the program, please send an email to info@aimusicawards.com and we will let you know how you can be a part of this opportunity at a limited time low rate. If you own a business and you are interested in placing your company’s logo or service in the event program, please email for rates. We are printing 1,000 copies to make sure everyone has the opportunity to get a copy. Note: ALL event programs will be handed out FREE of charge to every paid ticket holder. 100 programs will be reserved exclusively for members of the press and media. This feature event program is a full color illustration-magazine style layout. Artists and businesses will have a chance to publish a 250 to 300-word biography or professional ad, plus include up to 3 professional high-resolution photos for the magazine spread. We accept photos in Photoshop format (.psd), or in Adobe format (.pdf). Voting ends on January 20, 2014 at Midnight PST, so make sure you are promoting your categories until the very end. Thanks so much for being apart of the 3rd Annual Artists In Music Awards! We’re looking forward to a great New Year and will continue to keep you posted on the 2014 Artists In Music Awards finale!! 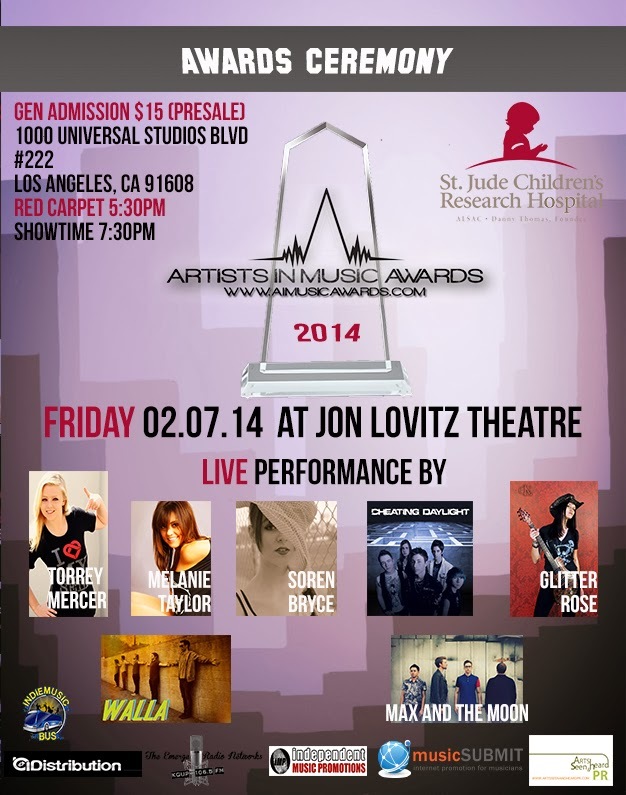 the 2014 Artists In Music Awards coming this February! thanks for your information gan..